I loved Disney’s Tangled just as much as my kids did when it came out a few years ago. It is still one of our favorite movies to watch together! Rapunzel is so loveable, brave, and kind. Eugene(aka Flynn Rider) is hilarious and so witty. It was such a great movie, and now the adventure continues with an all new Disney Channel original movie, Tangled Before Ever After. After all those years stuck in a tower, everyone’s favorite “barefoot princess” (Mandy Moore) yearns to make up for lost time. With the help of her true love Eugene (Zachary Levi), pals Pascal and Maximus and daring new friend Cassandra, Rapunzel postpones her wedding and royal duties to defy danger and boldly explore life beyond Corona’s walls. Sparkling with fun, adventure and music from the legendary Alan Menken, Tangled Before Ever After is a magical movie event!! 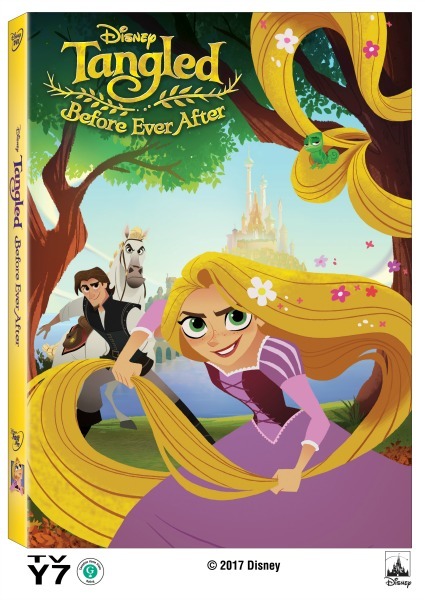 Tangled Before Ever after is now available on DVD. This original Disney Channel movie is such a great addition to the first Tangled movie. The music is so amazing, and the voice over acting is just as amazing. I adore Mandy Moore, and it was so great hearing her play and sing for Rapunzel again. I love that Rapunzel marches to the beat of her own drum. She is a free-spirited, barefoot, and adventurous princess who dreams of something more. My little 4-year-old daughter loves Rapunzel. She has been running around barefoot with a long blanket attached to her head pretending to be Rapunzel for days now. My kids also really love when there are fun activity pages to go along with their favorite movies. 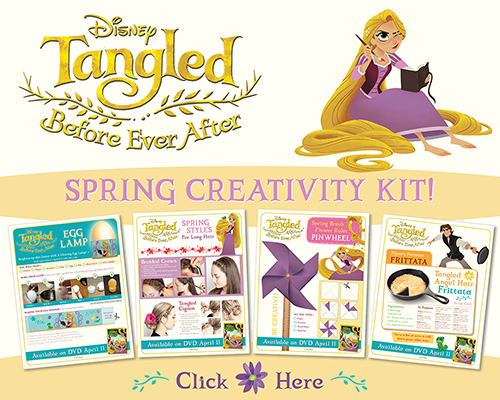 Click the picture below to get lots of fun Tangled activities. My daughter especially likes all the hair ideas! You and your kids will love this new Disney Original Movie Tangled Before Ever After. You can find it on Blu-ray, and Digital HD at Amazon, Target, and Walmart. I am getting this for the kids too. I am glad it has extra shorts at the end. Nice bonus. The girls love this movie. I am getting it for them now. Tangled is a great movie, looks awesome. This is such a cute movie. Looking ahead this would make a great stocking stuffer or smaller gift. I love this show too. I bet this is good. I love the original movie. My boys liked this one too. This is a movie I love watching with my kids!! !